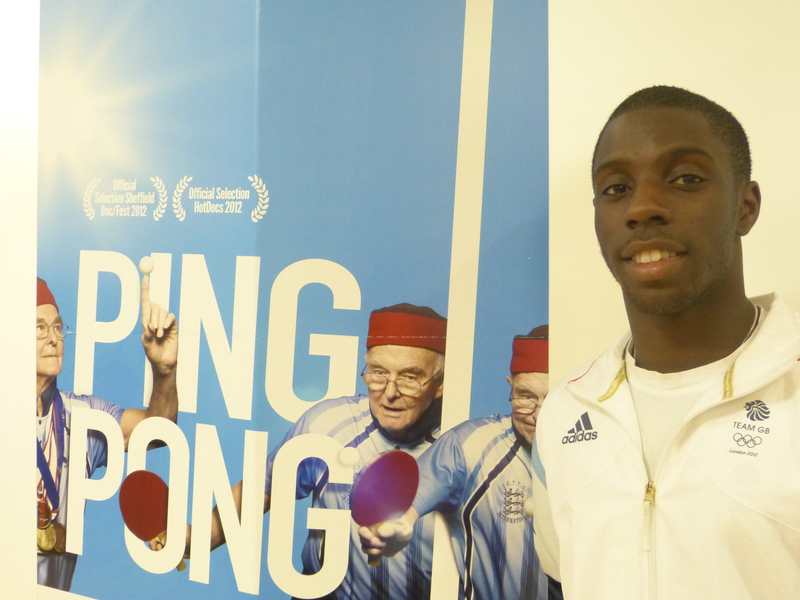 We were lucky to chance upon Darius Knight, of table tennis Team GB fame at Armley Leisure Centre this week and he kindly agreed to be interview for our Better Lives Blog. Darius is ranked number three in England and won both senior men’s doubles and mixed doubles titles at the English Championships. We watched Les D’Arcy in the Ping Pong film earlier, what are your thoughts about the older people playing table tennis? For me, I didn’t realise that the older generation were so active (not in a rude way!) but having seen the film, it seems they are! How amazing were the players? Even more so as they were mostly over the age of 80! Seeing the enthusiasm from Les, seeing that table tennis was clearly keeping him fit and engaged in life; the reason he woke in the morning and keeping his spirit alive? That the sport I love so much had such a positive impact, now that’s something! How fit do you need to be to play table tennis? You don’t need to be really fit to play table tennis – certainly not fit like going out for a run or lifting weights. It should be more about enjoying yourself, and if you get fit at the same time that’s great. I find it’s a very healthy sport and it helps keep your mind active, everyone can play and if you do enjoy it you will get fitter. What advice would you give to someone who wants to play? The more you play the more fun you will have; you will get fitter and get better at it. Table tennis is a social game and is a great way to meet new people; while I’ve been playing I’ve met new friends all over the world. It can really help everyone make new friends and I’m personally of the mind-set that you can never have enough of them. As for playing, don’t be afraid, just pick up the bat and get out there- you’ve absolutely nothing to lose, but so much to gain. As with anything new, there’s absolutely no guarantee you’ll be an instant ‘natural’ at it but it’s really not a hard sport to pick up. Some people get frustrated but you’ll find that the people who play and coach table tennis are really friendly, relaxed and supportive. No matter what age you are, what disability you have or illness, do what the players on the Ping Pong film do – GO FOR IT! It really is a sport for everybody. What benefits can you get from playing table tennis? The first is it keeps you healthy, both physically and mentally. If someone who is 100 years old can do it and did then anyone can [reference to a player in the film Ping Pong]. I wonder what would have happened to many of the ‘over 80s’ if they hadn’t had table tennis in their lives? The lady with dementia who stopped eating? She started table tennis and it gave her routine and a really positive focus to get up each day. How much better was she? What an improvement (life changing) to where she could’ve been. The man who had prostate cancer and was told he had a week to live but was still there 2 months on. He never gave up – in fact not only never giving up, but winning Gold in the doubles! That’s inspirational. Every player in that film was inspirational, and if you want to see how it can benefit you, just watch the film. You’ll be playing in no time. The social side of playing and training too. Well, it’s a great way to meet friends, especially if you make it part of your regular routine. Again, from the footage of the World Championships for Veterans, we saw how the players started to become friends. Some, it was clear, were life-long friends. Do you agree that age doesn’t matter if you want to take up table tennis? Age definitely doesn’t matter, after everything we’ve seen here today, that totally reinforces that belief. Hopefully you will see me at 70 years old playing in the world championship and winning a massive title! Age just doesn’t matter, the beauty of this sport is that anyone can do it; it doesn’t matter if you’re white or black, young or old, whatever religion or nationality. Table tennis is universal. Do you have a final message for anyone who might be thinking of taking up table tennis? If you think you might like to try table tennis or, indeed any other sport, do it. Have a go. Please have a go, it could be the best thing you ever did. Secondly, make sure you have fun. If you’re not having fun, find something else until you do; and finally, if you wanted to watch something, please try and get a hold of Ping Pong, it’s inspirational; unbelievable. It’s extraordinary. Our thanks go to Darius for taking the time to talk to us.